Reflective practice is an important tool in practice-based professional learning settings where individuals learn from their own professional experiences, rather than from formal teaching or knowledge transfer. It is an important process in continuous professional competency and development. Reflection is nothing to be scared of – we all reflect every day in different forms and about different things. Learning to be a reflective practitioner includes not only acquiring knowledge and skills, but also the ability to establish a link between theory and practice, providing a rationale for actions. Reflective practice is the link between theory and practice and a powerful means of using theory to inform practice, thus promoting evidence based practice. (1) It can be used by both student paramedics and practicing paramedics to reflect on their strengths, weaknesses and potential areas for development. Professional reflective practice may take the form of reflection-on-action or reflection-in-action. (2) Reflection-on-action encourages practitioners to re-live past events in order to develop an action plan for similar events that may occur in the future. There is a tendency when one performs reflection on action to focus on the negative aspects of one’s performance. Reflection-in-action encourages practitioners to observe and reflect on past situations from both their own perspective and those around them at the time of the event, which may aid in recognizing positive actions and behaviours. Reflective practice remains a relatively unknown concept in paramedic practice compared to other healthcare professions such as nursing, where it has been embraced as an essential foundation of professional practice and continuous development. Paramedic associations and regulatory bodies worldwide suggest that all paramedics maintain a personal continuing professional competency (CPC) or continuing professional development (CPD) portfolio; a reflective journal or diary is an essential part of this portfolio. How many of you discuss calls and patient outcomes with other practitioners back at base or in the ambulance? Hands up! Quite a few? As we thought – so reflection on practice is not a new concept to paramedics, but the formal application of it as part of professional development may be. Putting these reflections down on paper and in a logical, structured manner is what proves difficult to many practitioners. Many proposed paramedic-specific models of reflection have been put forward by various paramedic scholars worldwide, including the CRASHED model and the IFEAR model. 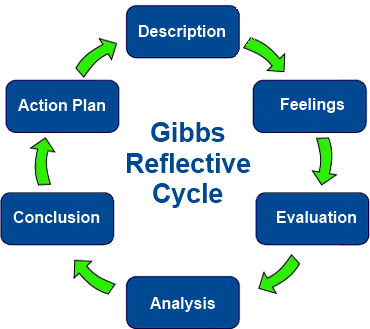 (11,12) The Gibbs Reflective Cycle (13) is commonly used in nursing and other allied health professions, and the authors recommend this as an introductory reflective process for paramedics. It is comprised of a logical pathway for constructing reflective diary entries, and it emphasises the role of emotions and acknowledges their importance in the reflective process. This can be key to understanding one’s actions and the actions of others when performing reflection-in-action. A description of the call, simulation or incident, with relevant details. Remember to maintain patient confidentiality if you are reflecting on a clinical event. Don’t make any judgement yet or try to draw conclusions; simply describe the events and the key players. Set the scene! What happened? Don’t move on to analyzing these yet, simply describe them. How were you feeling at the beginning? What is the impact of different perspectives e.g. personal / patients / colleagues’ perspectives? What has this taught you about professional practice? Or about yourself? Once you are comfortable with the process of reflective practice, you will begin to focus on the evaluation, analysis and planning phases in more detail. Your reflections will likely become more insightful, probing and detailed as opposed to a generalised narrative description commonly seen when beginning reflective diaries. Some authors refer to achievement of this level as ‘critical reflection’. 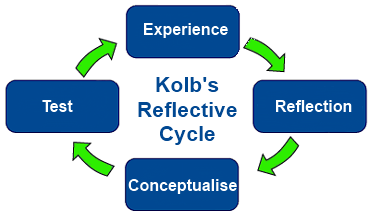 Gibb’s Cycle is useful for reflecting on events such as clinical interactions and simulation scenarios; however, if you are looking to reflect on a learning experience (such as completing a course) then you may find Kolb’s cycle more applicable. Link/Conceptualize – applying the knowledge gained to various different situations and problems. From the student’s perspective, it is important that the process of reflection is incorporated into the curriculum before beginning preceptorship and ride-outs. As this is the transition period between student and professional paramedic, having a full repertoire of not only practical skills but critical thinking and academic skills also, is essential. Prior to commencing ride-outs, students in the Fanshawe College Primary Care Paramedic Program are given background knowledge on how to apply a formal model of reflection and the potential benefits that are associated with the process of self-reflection. Additionally, it is reinforced that reflecting on performance is not to be labour-intensive or a chore, but instead an opportunity to learn and grow to one’s full potential. Generally, students focus on steps that they need to complete on each call such as the primary survey and further patient assessment. Directives are learned, evidence-based practice is encouraged, and simulation scenarios are debriefed. These approaches are of course important, yet self-reflection post-call goes untouched. Students can get by in a classroom setting without having to take very much time to self-reflect, if at all. After being taught specifically about reflection and its benefits to the learning process it is obvious to us that reflection should be incorporated in the classroom before the student goes on the road. As students who are currently completing ride-outs keeping a reflective journal has become an integral part of the educational experience. Every single call is a learning experience yet it is hard to take away more than a few points while in the moment. To put it in perspective, from a student’s point of view, every time the tones go off it is an adrenaline rush. All eyes are on the student as they go through the call. Students are trying to ensure the patient is confident in the care they are providing, while attempting to impress their preceptor. All while racing through mental directives, standards, and protocols. Yes, major issues will be noted and addressed in the moment or in the immediate aftermath but minor improvements which could be addressed, how the student felt at the time, and ultimately how the situation could be improved are generally topics which arise during reflection. Taking the time after the rush is over, the paperwork is submitted, and the call has been debriefed to quietly write down certain aspects of the call is extremely beneficial in both the short and long-term. Students have so much to learn from every call they attend. It is important to have an outlet to make note of the details, gather one’s thoughts, and think about what was great about the call and what could be improved for future encounters. Having the ability to reflect on a call and review how one handled it, interpret what occurred, critique the management of the call, analyze communication with the patient and determine what one did and did not like is a valuable skill. Additionally, acknowledging one’s feelings and personal thoughts is important as discussed earlier. (2) Reflection-in-action allows the opportunity for the student to explore how they really feel about different aspects of the event as well as their own performance throughout. Keeping reflection entries in a journal allows the student to look back whether it be days, months, or years down the road and use the lessons learned as encouragement to keep learning and improving throughout their paramedic career. Reflection should be a never-ending process. Performed regularly, reflective practice will enable you to pay attention to the details of your clinical practice, and your ability to bridge the gap between theory and practice. Reflections will mature and develop over time, and this is a natural evolution in a practitioner’s reflective journey. Bearing this in mind, you will be begin to anticipate upcoming situations as being new learning experiences and in doing so, become a more informed, safer and more skilful practitioner. Tsingos C, Bosnic-Anticevich S, Smith L. Reflective practice and its implications for pharmacy education. Am J Pharm Educ. 2014;78(1). Somerville D, Keeling J. A practical approach to promote reflective practice within nursing. Nurs Times. 2004;100(12):42–5. Bolton G. Reflective Practice: An Introduction. In: Reflective Practice: Writing and Professional Development. 2010. p. 1–24. Burns S, Bulman C. Reflective Practice in Nursing: The Growth of the Professional Practitioner. Oxford: Blackwell Publishing Ltd; 2000. Conway J. Nursing Expertise and Advanced Practice. London: Quay Books; 1996. Johns C. Becoming a Reflective Practitioner. Practitioner. 2004;3rd(February):286. Brookfield S. Developing Critical Thinkers: Challenging Adults To Explore Alternative Ways of Thinking and Acting. Milton Keynes: Open University Press; 1987. Constantinou M, Kuys SS. Physiotherapy students find guided journals useful to develop reflective thinking and practice during their first clinical placement: A qualitative study. Physiotherapy. 2013;99(1):49–55. Koh YH, Wong ML, Lee JJ. Medical students’ reflective writing about a task-based learning experience on public health communication. Med Teach. 2014;36(2):121–9. Asselin ME, Fain J a. Effect of reflective practice education on self-reflection, insight, and reflective thinking among experienced nurses: a pilot study. J Nurses Prof Dev. 2013;29(3):111–9. Smart G. I.F.E.A.R reflection: an easy to use, adaptable template for Paramedics. J Paramed Pract. 2011;3(5):255–7. Gibbs G. Learning by Doing: A guide to teaching and learning methods. Reflective Gibbs – Study Skills – Upgrade Study Advice Service – Oxford Brookes University. 1988. 129 p.
Price A. Encouraging reflection and critical thinking in practice. Nurs Stand. 2013;18(47):46–52. Kolb DA, Fry R. Toward an applied theory of experiential learning. In: Theories of Group Process. 1975. p. 39. Boyatzis RE. Unleashing the Power of Self-Directed Learning. In: Changing the Way We Manage Change: The Consultants Speak. 2002. Dayna Hilliard is a student paramedic in the Primary Care Paramedic Program in Fanshawe College, London, ON, Canada. Kaitlynn James is a student paramedic in the Primary Care Paramedic Program in Fanshawe College, London, ON, Canada. Portions of this article were originally published online at http://prehospitalresearch.eu/?p=1550 under a Creative Commons BY-SA-NC 4.0 Licence.